We are a topmost company in the manufacture, supply and export of Filling Machines such as Glass Liquid Filling & Sealing, Semi-Automatic Bottle Filling Machine, Automatic Bottle Filling Machine, and Paste Filling Machine. These products are operating to fill materials in the packets or bottles. These have high quality and are designed by experienced professional experts. Last but not the least these are available at cost effective price. 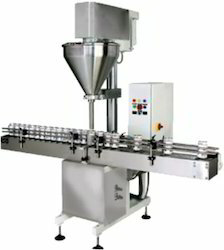 Paste Filling Machine is perfect for handling products with different viscosities with contact parts made of SS 304 / 316. It possesses clean cut-off for drip free filling, positive displacement type suction as well as delivery stroke. The piston is a specially designed one, which does suction and filling in one stroke. It has quantity adjustment screw for setting the desired volume. Suitable for cream, Mango pulp, Paint, Paste, Chywanprash, Gulkand, Kiwam, Adhesive, Grease, etc. Dimensions / Weight 520 x 620 x 750 mm / 200 kgs 8” X 10” X 24” / 20 kgs. Semi Automatic Powder Auger Filling Machine Model PFM-100 is perfect for handling different types of powders with contact parts made of SS 304 / 316. Microprocessor based control system provides precise selection and adjustment of fill amounts and machine functioning. This is useful for filling of all types of Powders in Bottles, Jars & Glasses. Motor: 0.75 HP, 230 Volts / 415 Volts. Automatic Powder Auger Filling Machine Model PAF-100 is an economical solution to your filling production line conveyor to reliably move and position containers for filling, dispense the required amount of product, and then quickly move the filled containers away to other equipment in your line (e.g. cappers, labelers, etc.). Microprocessor based control system provides precise selection and adjustment of fill amounts and machine functioning. This is useful for filling of all types of Powders in Bottles, Jars & Glasses. Motor: 2 HP Three Phase, 415 Volts. Semi Automatic Bottle Filling Machine is a Double Head Liquid Filling Machine suitable for filling Pharmaceuticals, Beverages, etc. such as juices, petroleum jelly, syrups, drinking water, paints, strainers, perfumes, flavored milk, dahi, adhesives, shampoo, edible oil, hair oil, lube oils, coolants etc. in any shaped container having Plastic, Glass or any other surface. All contact parts are made of SS (304/316). The stroke of the syringe is adjustable to adjust for the quantity to be dispensed. Non return valve is accurately designed to achieve drip proof result & can be provided with diving nozzles for frothy foamy liquids. This is useful for filling of Beverages, Milk products, etc. in Bottles & Glasses. 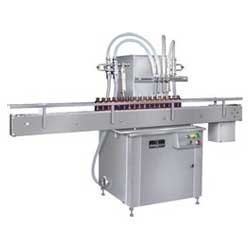 Automatic Bottle Filling Machine is suitable for filling Pharmaceuticals, Beverages, etc. such as juices, petroleum jelly, syrups, drinking water, paints, strainers, perfumes, flavored milk, dahi, adhesives, shampoo, edible oil, hair oil, lube oils, coolants etc. on a continuous conveyor line with no bottle no fill attachment. The speed depends on number of syringes & has diving arrangement for foaming products as well as specially designed nozzles for drip proof filling. All contact parts are made of SS (304/316). The stroke of the syringe is adjustable to adjust for the quantity to be dispensed. This is useful for filling of Beverages, Milk products, etc. in Bottles & Glasses. Motor 2 HP Three Phase, 415 Volts. 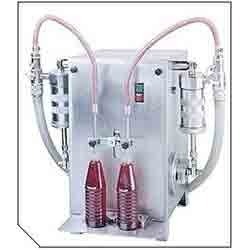 Looking for Filling Machines ?